Ok, I’ve been giving it a lot of thought, and I’ve finally figured out what I want from Japan, should I win Adam’s contest. To start with, I want a Megaman plushie/action figure. 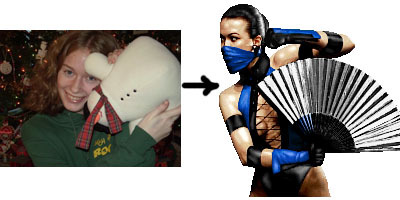 I’ve been a fan of the Megaman games since I was a kid. 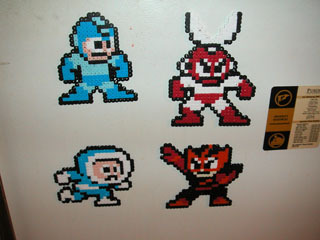 I’ve even got a set of sprites hanging on my fridge. Are Megaman action figures commonly available in Japan? Beats me, but if they’re available at a Japanese Toys ‘r Us, I want one. Next, I’d want a paper fan for my girlfriend. Finally, I’d want candy. Lots and lots of Japanese candy. One of the guys at the office brought in a box full of various candies yesterday, and they were really, really good. I have no idea what they were called, as the text was all in Japanese squiggly lines, but they were good. The first type I tried looked like little pointy depth charges. On the outside they tasted like rock candy, but on the inside, they were filled with what can only be described as caffeinated cocaine. I only had one to prevent diabetes. The other kind I tried was this caramel chew thing, but it was much better than any kind of caramel candy I’ve had from the States. Basically, I’d want a large variety of candy to try. Of course, I want a box of pocky thrown in there with the rest of the candy too. So there you go. That’s what I’d want with $65 worth of Japanese stuff. I’ll remind you all that the contest is open to anyone, so go enter. Yarr, thanks for the entry!